Today I managed to lift up everything in the top of the mast. It Went fairly smooth and I managed it allmost by my self. The wife helped me controlling the winch the last part when everything was going over the edge at the top. Was a bit tricky to fit the 4 u bolts as the tube was just a bit tight but it went ok after some fiddeling. Will continue tomorrow with putting up the support wire for the cables and mount the elevation linear actuator. The matching was a bit high in frequency and have no clue why as all individual antennas was tuned to resonance at approximately 432.200 MHz. It will have no or very little effect of the performance as the matching on .200 is good enaugh but it's still irritating. No the antennas are done with all support structures and everything is alligned and awaiting the dipoles and final tuning. Last week we got 54 mm of rain and this week so far 23 and more or less rain everyday in the afternoon when I have time to do any outdoor work. But some indoor work has been done with for example all stacking cables is done and within 3 degrees of phase difference for all 8 and the two 1/2" Cables differs 0.6 degrees. 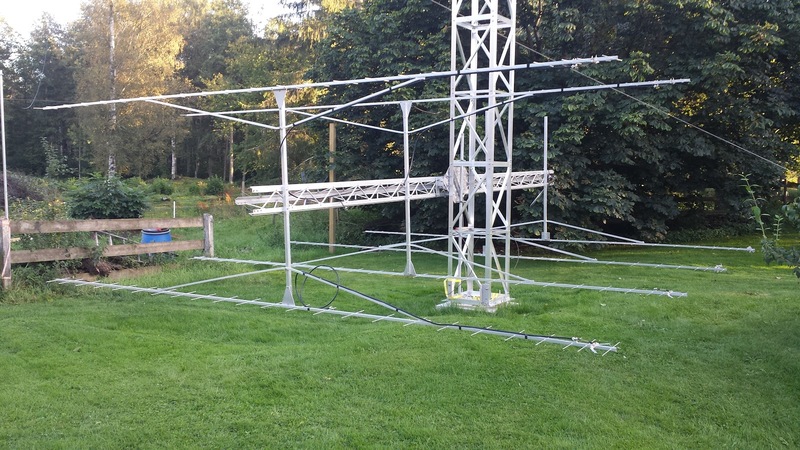 The dipoles are finnished and awaiting the rain to stop and hopefully it will be a nice day tomorrow. Starting to regret I made the mast the full 6 meter instead of 4 meter which is a more convinient height and is really enaugh for this antenna. Let's see what happends in the future but I will not shorten it now, maybe next summer. 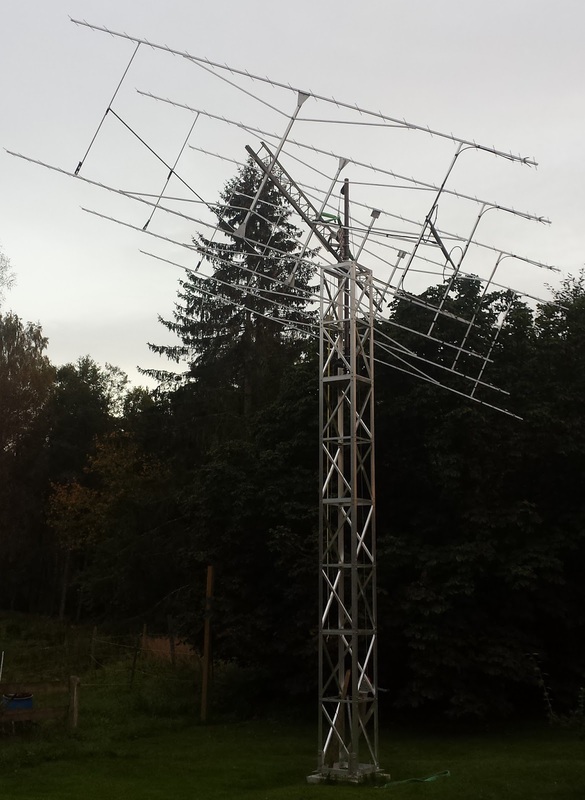 This afternoon I got the time to mount and roughly allign the remaining 2 antennas Before the rain started again. Checked the material for the supports and will use 16mm round tubes in the front and 20mm Square in the back. Found some angle pieces that will be used as mounting bracket for the supports. The rain did not stop so I went inside and continued with the transverter instead. 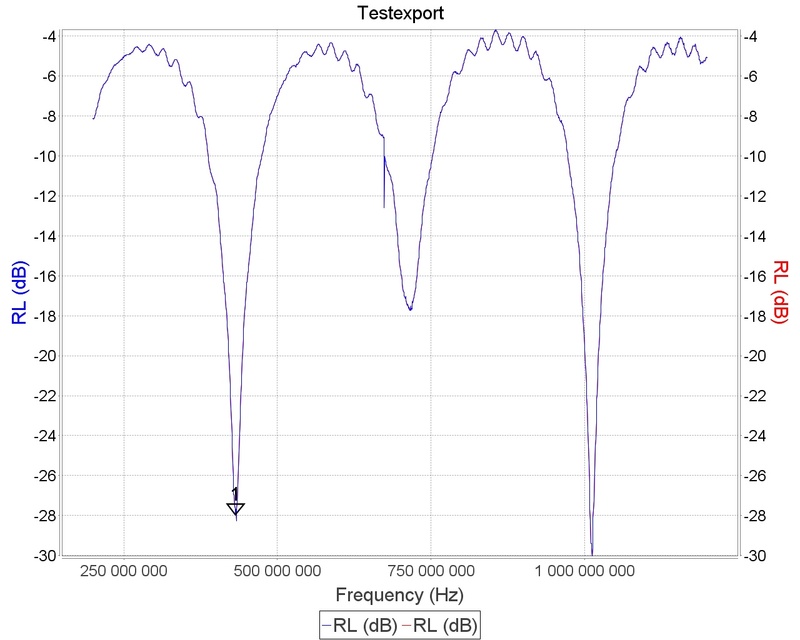 Did a fix for the rx side tuning and the results is 1 dB NF and 26dB gain. 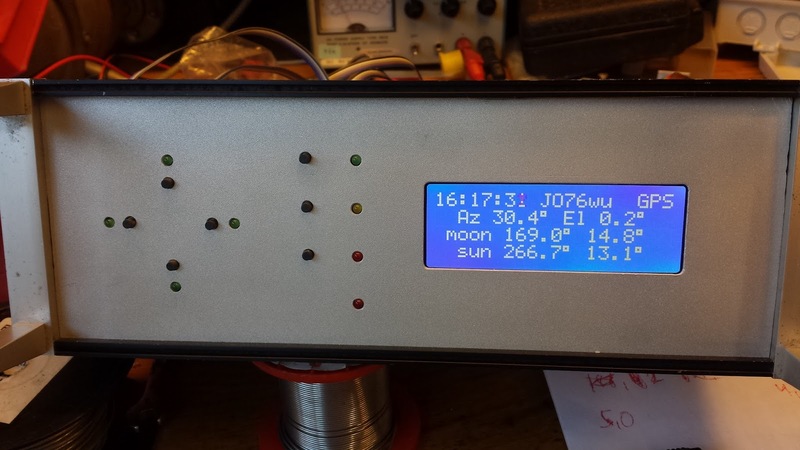 Configured the sequencer and TX scheme inside the transverter as well but I will use 24V at RX to the mastmounted relay and the preamp so I need to mount a 12 to 24V boost converter inside the transverter. I switch the preamp and relay at the same time at RX so if anything fails the relay go into TX. Did so in the past and never blown a preamp so I am confident it will work. 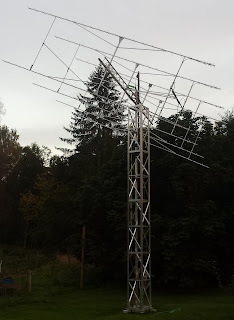 Finally a day without rain pouring down the whole day so I started mounting and aligning the antennas today. Finnished 6 of them and will continue tomorrow with placing the remaining 2 and adding support structures both front and back. Maybe there is no need in the back but it will act as support for the feeding Cables too. Discovered a few what I think is weak spots in the antenna mountings that I will correct this week too. 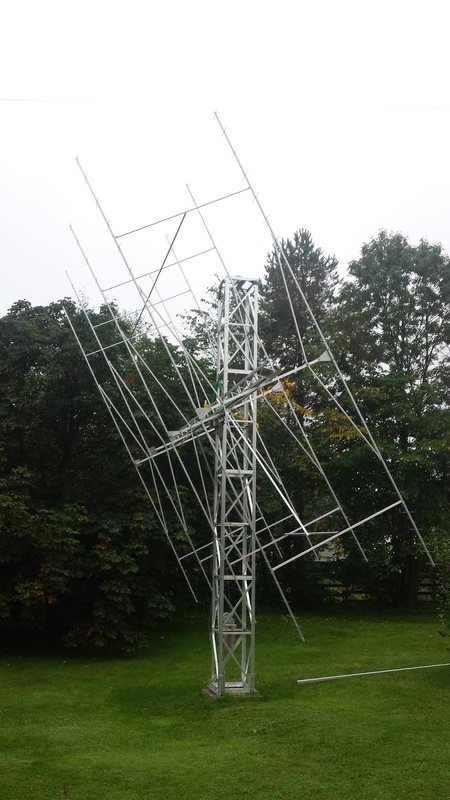 So hopefully I will be able to lift it higher this weekend and make the final tuning of all antennas before raising it all the way up. Need to rework the feeding of the antenna built last year first as I did not have any stainless steel locking washers back then so they are slightly rusty which needs to be fixed. 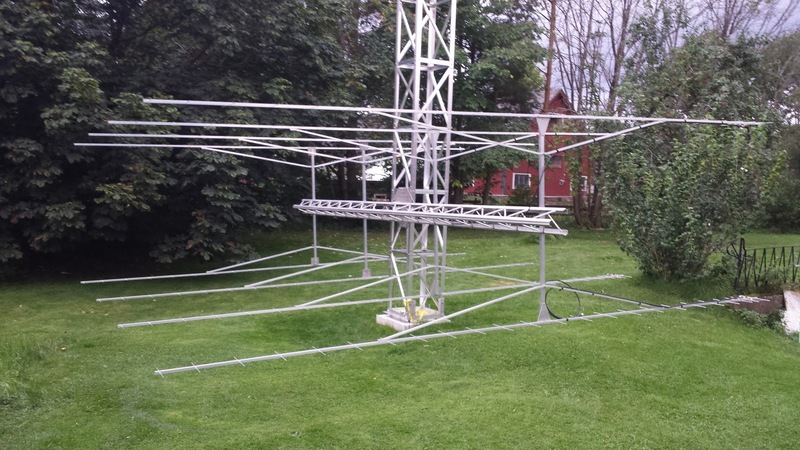 Every sunday at 10 AM we are a group of Swedish VHF operators going on 80 for a small ring QSO and update ourself on different projects and discuss all sort of related issues. 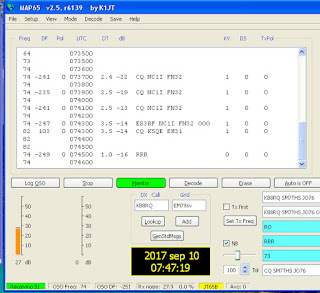 This morning I discovered that the moon was on the way down so I started MAP65 and hooked up the 70cm antenna as I saw some activity on livecq. 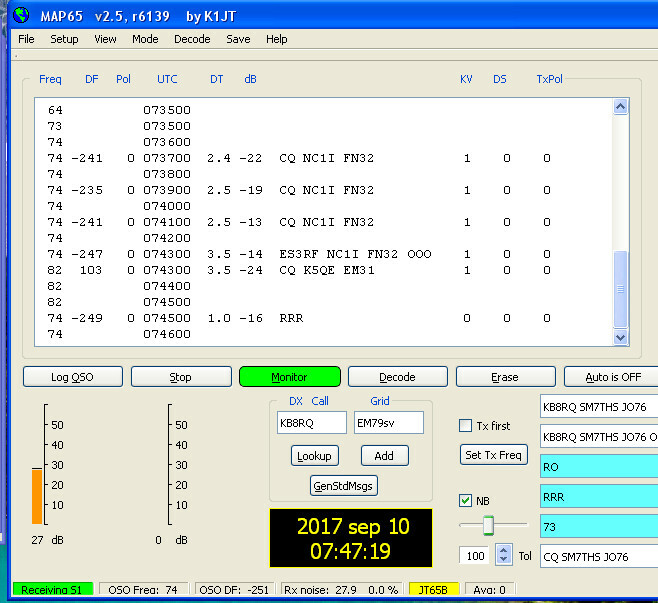 The below screendump from Map 65 shows some good propagation. 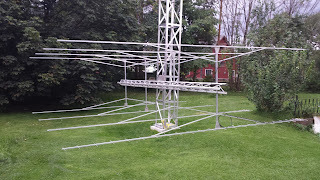 Antenna used is a 19el DG7YBN without elevation, 12m RFC400 cable, preamp in shack and a FCD+ receiver. 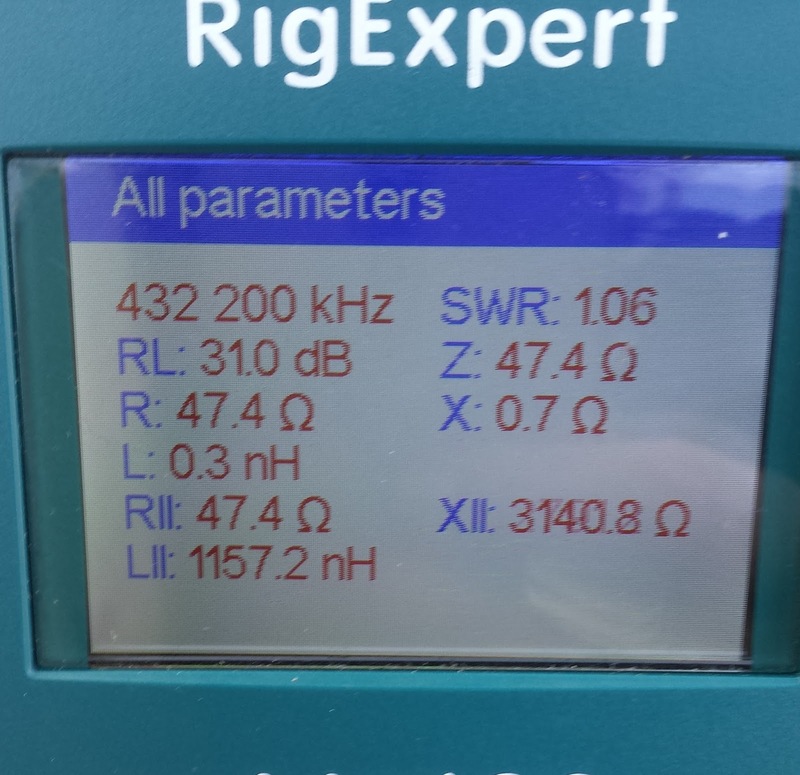 NC1I at -13 dB was suprising and K5QE easily detected but do not know what rig he is using. My plan was to use 4 to 1 1/2 lambda power dividers that was 5 times 1/4 lambda on each side. But for some reason this seems difficult. Built my two dividers and they both behaves with less matching performance than on the 1/4 lambda resonance and 3 !/4 and even 7 1/4 lamba is good but not 5. Measured other dividers of the same kind I built before and they more or less behaves in the same way. So I decided to change to 3 1/4 lambda on each side instead and then it worked as expected. Anyone seen this phenomena before? Picture above shows measurements of the 3 1/4 lambda divider which is the same as a two meter divider. 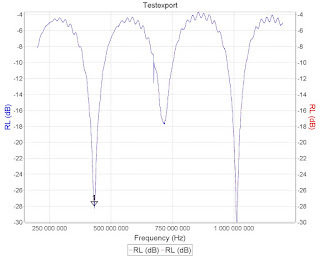 The left resonance is for 432 MHz which here is the 2 nd resonance but the 144 MHz cant bee seen here as the mini VNA with extender cant work below 200 MHz. 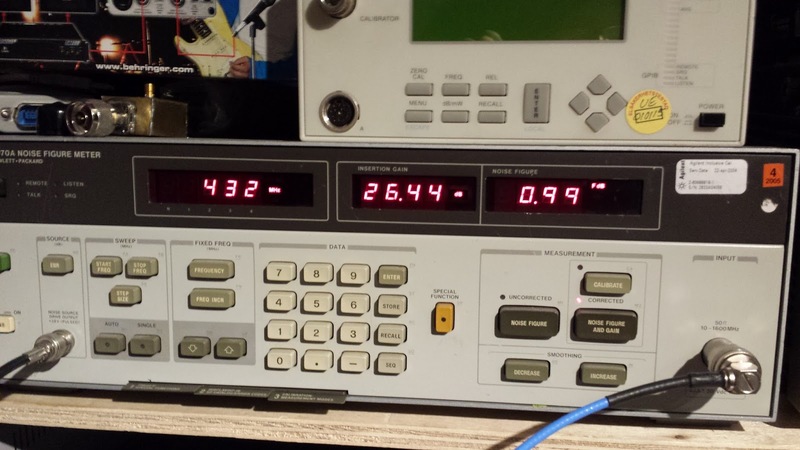 So all is ok on 432 at the marker but look at the third resonace at approximately 700 MHz what a poor matching. 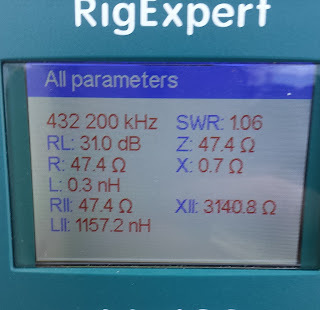 This is the 5 1/4 lambda frequency for that divider and close to 1GHz is the 7 1/4 lambda frequency which again is ok.
Its not a big concern but it will require some longer feedeing cables from the antennas to the divider but I am a bit puzzled and irritated about the thing.